If you thought the Bush family was essentially done attempting to run the country, you are wrong. The fourth generation of the powerful Bush political dynasty that has already seen two presidents named “George Bush,” not to mention a senator and a governor, is about to make his entrance stage left through a low profile but still powerful Texas office. 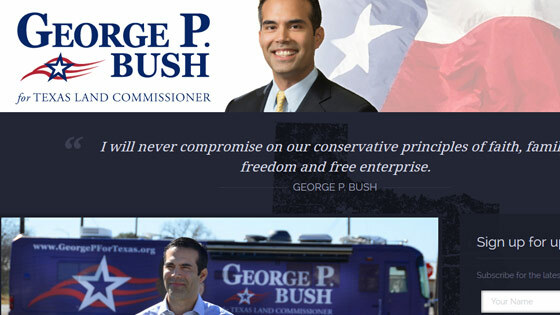 Meet George P. Bush, son of former Florida Governor Jeb Bush, nephew of former President George W. Bush, grandson of former President George H. W. Bush, and great grandson of former Senator Prescott Bush for whom his middle initial stands. George P. Bush is currently running for Texas Land Commissioner on a Republican ticket, a little known but powerful position in the Texas government that oversees vast tracts of both state and federal land, in a race that might as well be unopposed. At the time Bush entered the race, there was no Democratic opponent, but even now it’s only the illusion of opposition. Bush has millions at his disposal, while his only opponent in the GOP primary is fighting for the spot with less than $4,000 to his name (a name with much less recognition). This is a common tactic, to run for a little known position as a political “in” that will allow someone to quickly move up the chain of authority. Bush has been touted as a political prospect practically since he was old enough to walk. At 12, he spoke at his grandfather’s first nominating convention; at 24, he recorded TV commercials for his uncle’s 2000 campaign. (“I have an uncle who is running for president because he believes in … opportunity for every American, for every Latino,” he said in the ad. “His name? The same as mine, George Bush.”) Of George H.W. Bush’s 17 grandchildren, he once boasted of being the favorite. 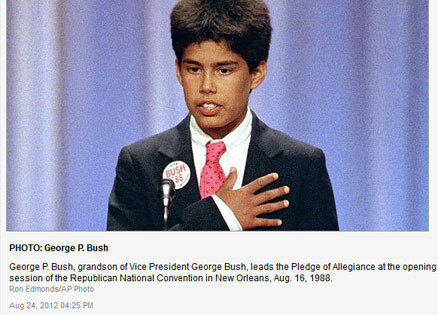 Below he is shown leading the Pledge of Allegiance at the Republican National Convention in 1988. He was 12. The power of the Bush dynasty goes well beyond their political offices alone. 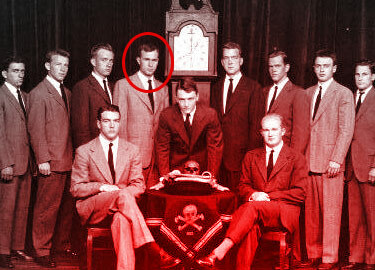 Prescott, George H.W., and George W. Bush were all members of Skull and Bones, an elite secret society at Yale. Prescott Bush worked for the Harriman family (fellow “brothers under the skin”) at Union Banking Corporation — a precursor to Brown Brothers Harriman — and played a documented role in financing the Nazis and Hitler’s rise to power leading up to and during World War II. 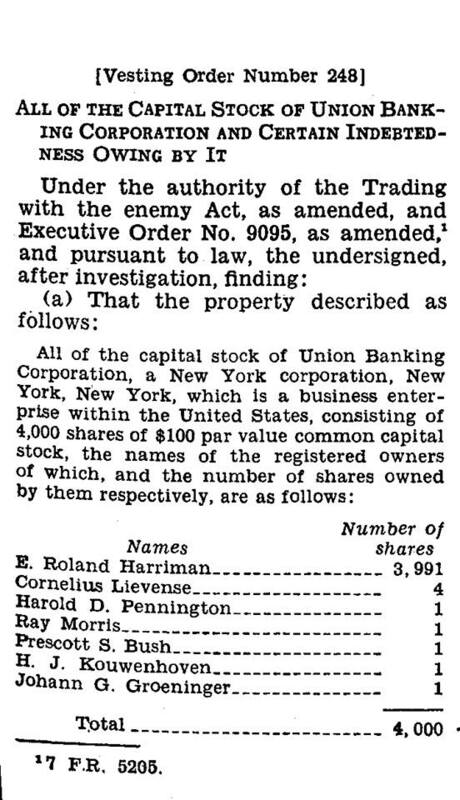 The bank’s assets were frozen under the Trading with the Enemy Act, but none of the shareholders, including Prescott, were ever prosecuted. Despite this scandalous history (or, rather, because of it), Prescott Bush played a role along with Averell Harriman in setting up the Central Intelligence Agency (CIA) and passing the National Security Act of 1947. Prescott’s son, George H.W. Bush, would later become CIA director in the 1970s. Webster Tarpley’s unauthorized Bush biography details the entire history. Recently, there has been a lot of talk about Texas flipping from a red to a blue state — that’s why George P. Bush has been meeting with people like Senator Rand Paul to discuss “Hispanic outreach” with behind-the-scenes help from electioneering mastermind and “Bush’s Brain” Karl Rove. The young Bush is himself part Hispanic (his mother hails from Mexico), and it is no secret he is being touted as the GOP’s secret weapon to woo Hispanic and minority voters to maintain Texas’s red state status. When an activist recently asked about his campaign and family history, George P. Bush played ignorant while his handler abruptly stepped in to end the interview. Ready for President Bush the third, America? Previous Post: Happiness is a Warm Gun: Diane SawyerNext Post: How Many Penises Can be on a Girls Softball Team Before it is No Longer a Girls Softball Team?